Eva: "You didn't create me! Baron Charles Frankenstein: As a matter of fact, I did." It was difficult for me to categorize director Franc Roddam's 1985 release The Bride as a "horror' film for this review. To be certain, it does concern the resurrection of life to dead bodies, and it seems that by nature any film featuring a character named Frankenstein would just have to be classified as a horror flick on principle. All of that notwithstanding, Roddam's version, from a Mary Shelley-tinged screenplay by Lloyd Fonvielle (writer of the 1999 version of The Mummy), does manage to become a much different sort of story. In fact, if it wasn't for the presence of "monster" or two, this could easily have been a very touching, straight-forward drama. The Bride was only Roddam's third film, after Quadrophenia and The Lords Of Discipline, but he still presented a visually impressive work. Working with a substantial $15 million budget, Roddam created a beautiful, gothic-looking film reminiscent of some of the great horror films of the 1930s. The film never was much of a critical success, and looking at it today, it is still hard to understand exactly why. It was no doubt difficult to market this film, as it wasn't a true horror film, nor was it a decidedly mainstream title. Despite the inclusion of rock star/actor Sting, and post-Flashdance Jennifer Beals, Roddam's novel treatment of the Frankenstein mythos never achieved major box-office success. The Bride opens with Baron Charles Frankenstein (Sting) attempting to resurrect a dead body during one of those horror film specific violent thunderstorms. Aided by Dr. Zalhus (Quentin Crisp) and the Igor-like Paulus (Tim Spall), Frankenstein and crew work an eerie Rube Goldberg-ish laboratory of massive winches, bubbling vials, and other bizarre contraptions in a desperate attempt to resurrect the dead. As seen in The Bride Of Frankenstein, Roddam's film deals with the premise of creating a mate for Frankenstein's earlier monstrosity, an unnamed hulk, played by Clancy Brown (The Adventures Of Buckaroo Banzai). As expected, when the resurrected body, portrayed by a too cute to have been dead Jennifer Beals, rejects the beast, Frankenstein's monster literally destroys the laboratory, kills Paulus and Zalhus, and is presumed dead in the resulting fire. As it turns out, the monster did not die in the fire. After escaping Frankenstein's castle, he sets off alone through the woods, where he eventually encounters short-statured Rinaldo (David Rappaport from Time Bandits). Rinaldo is heading to Budapest to join the circus, and he encourages the monster, whom he christens Viktor, to join him. The adventures of Rinaldo and Viktor are the film's highpoints, and their developing relationship is genuinely touching and comical. At this point, Roddam begins the telling of two parallel tales that will last for the duration of the film. One being Rinaldo and Viktor's adventures, and the other that of Charles Frankenstein and Beal's newly christened Eva, as they begin an almost Pygmalion-based relationship. Sadly, it is the Charles and Eva storyline that is a little convoluted, and suffers from some painfully slow passages and require some significant leaps of faith by the viewer. Eva seems to move from barely being able to speak, to mastering horseback riding and the fine points of Shakespeare in a heartbeat. To be honest, Beals performance here always seemed kind of stiff and bland, and I never fully accepted her as one of Frankenstein's creations. In fact, despite being the title character, her role seems to almost take a backseat to that of Rinaldo and Viktor, which form the core of the film's middle section. Much credit to the visual appeal of The Bride should be given to cinematographer Stephen Burum, production designer Michael Seymore and set decorator Tessa Davies. Roddam's film looks stunning, specifically the castle sequences. I found this to be a perfect throwback to the era of the classic Universal horror films. Though Fonvielle's screenplay falls apart a bit near the film's conclusion, Roddam manages to somehow overcome those shortcomings through smart direction. In hindsight, it would seen that stronger editing may have been helped here. The Bride is a rather daring film that challenges horror film afficionados preconceived perceptions about Frankenstein and his monster, while sticking with some of the more literal elements of Shelley's original work. Not a perfect film by any means, and burdened with an overall length that could have been trimmed by a good fifteen minutes. Yet this is a unique story told with a very impressive visual style. Image Transfer Review: The Bride is presented in a beautiful anamorphic 1.85:1 widescreen image transfer. Watching this film, it is very apparent how intensely director Franc Roddam worked to achieve a deep, gothic look similar in tone to the classic works of James Whale. Columbia Tri-Star has done a wonderful job with the restoration of this DVD release. Colors are rich and deep, and all of Roddam's visuals still retain their impact. I found little or no physical imperfections with this transfer, with only minimal grain issues during some of the night sequences. For a film with as many night scenes as this, shadows have great depth and provide excellent contrast. Some minor edge enhancement is apparent, but not severe. Audio Transfer Review: Columbia Tri-Star has issued The Bride with four 2.0 surround mixes, in English, French, Spanish and Portuguese. A solid 2.0 mix can sound much better than a poor 5.1 mix, and this release is a perfect example. Maurice Jarre's somber score has real body, and sounds fuller than would typically be expected from a mid-1980s film. An impressive use of the rear channels for ambient background sounds, as well as the score, add great depth to the overall experience. Dialogue was never swallowed by the music, and was consistently crisp. Spatial imaging is subtle, but effective, and make these two-channel surround mixes that much more deceptively enveloping. Extras Review: The Bride has been treated to a nice set of bonus materials, though on the surface it may seem a little sparse. A nice thematic set from Columbia Tri-Star, with trailers for The Bride, Bram Stoker's Dracula, and Mary Shelley's Frankenstein. All are presented in 1.85:1 widescreen, with The Bride, as the only anamorphic one of the bunch, ironically looking and sounding the worst out of all three. Director Franc Roddam provides a nice, informative scene-specific commentary track. Thankfully, this commentary is not simply a recitation of what we are seeing on the screen, but an insight into the production of what was a difficult to market film. He comments on the difficulty filming a story that is essentially two parallel tales intercut, and how The Bride dared dabble in the sexual politics and feminism of the time period. It is important to note that Roddam basically removed the horror element from this film, and his commentary track touches on that topic, as well. At times, Roddam's commentary is quite poignant, and he shares more than simple production anecdotes. Occasional gaps of silence do little to mar the overall impact of Roddam's remembrances. Of all the talent present in this film, only Sting and Jennifer Beals were deemed worthy of filmographies. Seems a bit uneven, if you ask me. The supplementals, specifically Roddam's commentary and the themed trailers, are a nice bookend to a unique genre film. Also included are a respectable 28 chapter selections, as well as subtitles in English, French, Spanish, Portuguese, Chinese, Korean, and Thai. 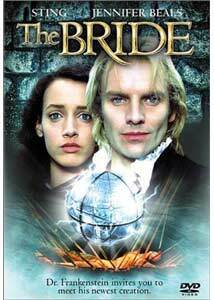 The Bride is an engaging twist on the Frankenstein legend, and director Franc Roddam succeeded in the creation of an extremely visually compelling film. As a huge fan of James Whale, I found Roddam's work to be evocative without appearing as outright plagiarism. Plagued partially by a runtime that goes on a bit too long, this is still a satisfying tale. Strong performances by David Rappaort and Clancy Brown deflect the stiffness of Jennifer Beals weak acting, and make this title definitely worth a rental.